Service Fees allow either a percentage charge or flat fee to be added to an order. A service fee can be added manually or automatically applied, based on certain criteria. Keep in mind that a service fee is not the same as gratuity. In the Management Console, navigate to the Settings tab. Using the search box, type Enable Service Fee. Then select the check box from the left so the settings appear on the right side of the screen. In the Management Console, go to the Products tab and then click Service Fees from the left menu. Now, click + Add Service Fee. Fill out the service fee Name, Amount, Type, and Application. Then, click Save. If you would like this service fee to automatically apply, click the details icon from the right. 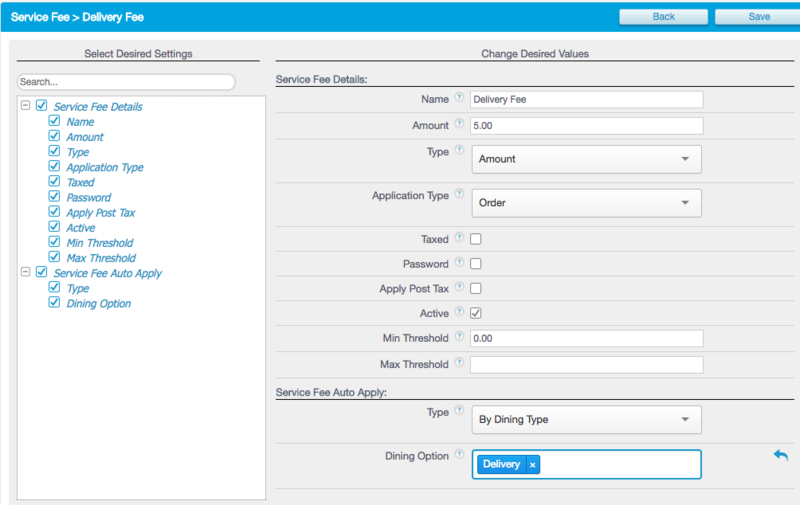 Under the Service Fee Auto Apply field, select Dining Option as your Type. Under Dining option, type in Delivery. Click the details button of the existing service fee. 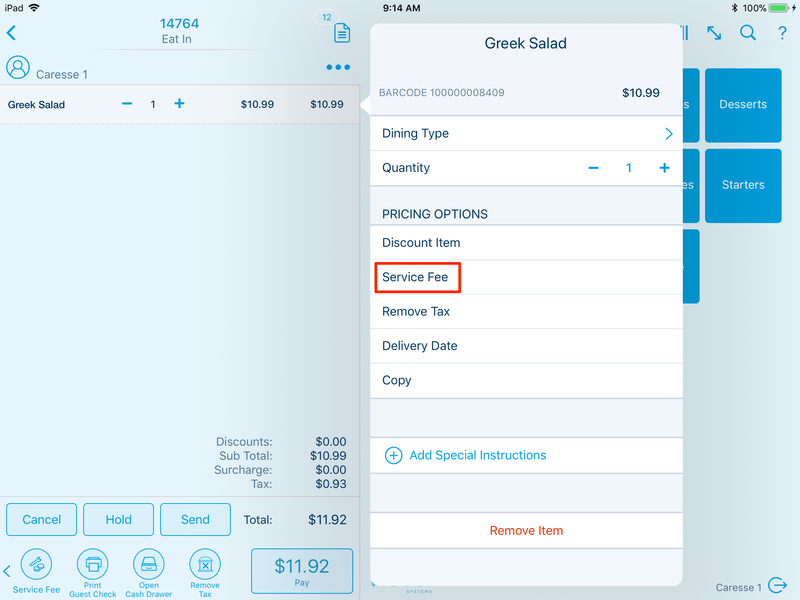 By Dining Type - automatically applies service fee depending on the dining option of the order, i.e. Dine In, To Go, Drive-Thru, etc. By Guest Count - Automatically applies depending on the number of guests at the table. By Payment Type - Select what type of payment type to automatically apply the service fee. By Time Slot - Automatically applies the service fee from within the selected time frame. You can set this by specific date and time. Depending on the option selected for Type, enter a dining option, payment option, time slot, or guest count. Then click Save. Refresh the Point of Sale before testing automatic service fees. Then tap the Service Fee button. 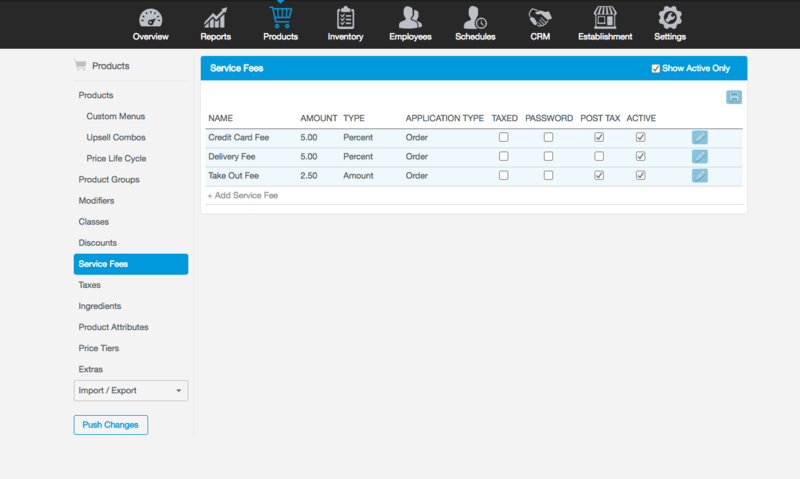 If a service fee was preset in the management console, you can tap that service fee. 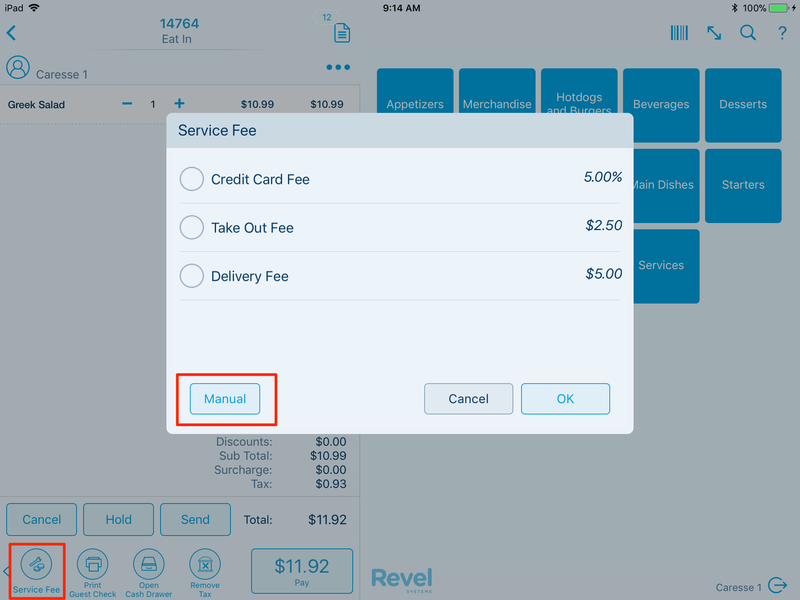 If a service fee is not created, select Manual and enter the amount and reason for this fee. Then tap OK.
To apply a service fee to the entire purchase, use the action icons at the bottom of the order screen. Scroll the action icons to the left or right until you see the Service Fee icon.